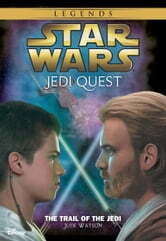 Knowing that Obi-Wan Kenobi did not choose Anakin as an apprentice, Anakin is beginning to doubt his Master's commitment in this second volume of the Jedi Quest series. With this in mind, Master and apprentice head out on a training exercise that turns into a struggle to survive. When they discover that bounty hunters have been hired to capture the Jedi, Obi-Wan and Anakin must avoid the traps and ambushes...and discover who is behind the deadly Jedi hunt.